From The Eagle, so apologies for the quality. Rarely in this town do buildings vanish without a trace. Sure, Fish Richard's is gone completely, but those are exceptions, not rules. Did you know there was a tiny strip center where the Northgate parking lot is, which is next to the Promenade? It was built at some point in the 1960s (it existed in 1971) late 1960s or early 1970s, and it featured four spaces, with the end store being a UtoteM, a convenience store commonly found in the South. 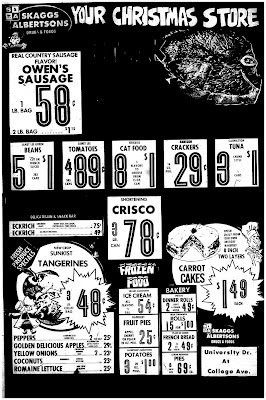 The chain was ultimately bought and absorbed by Circle K in the mid-1980s but most of the UtoteM stores ended up closing (more on that later). A bit blurry, but on the original, you can actually make out the U TOTE M sign! 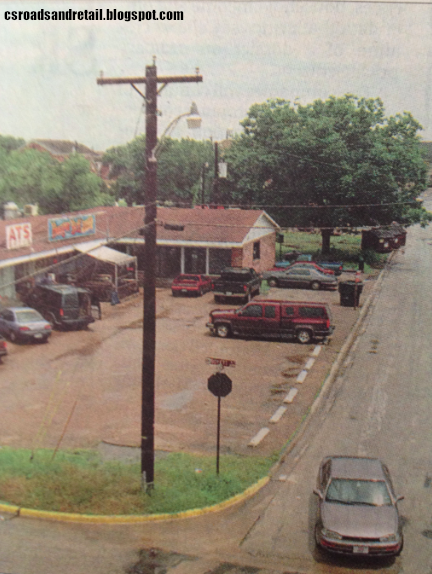 A view from the early 1990s, looking east toward College Main. Besides the UtoteM, the tenant history has been a little hard to tell: at one point, the three tenants renumbered. In the early 1980s, there was The Varsity Shop (a), Aggieland Washateria (b), and UtoteM (c), and in 1988, there was The Varsity Shop (a), Burger Boy (b), and "The Deli Shop" (c). 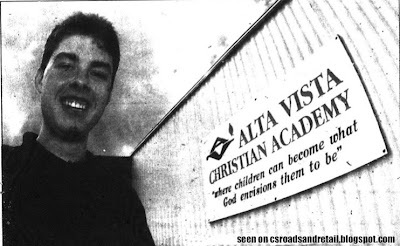 At some point, however, the space that was UtoteM ended up becoming B, Burger Boy was in C, and B was Advanced Tutoring Services (in the early 1990s). In the mid-1970s, Planned Parenthood even maintained an office here (before their location at 303 College Main) in the era of UtoteM and Varsity Shop. Advanced Tutoring Services (ATS) was owned by the owners of Burger Boy, who might've sub-divided suite B. Additionally, in the mid-1980s (1983/1984 range), there was also Chanello's Pizza, which may have predated the spot where Burger Boy was. 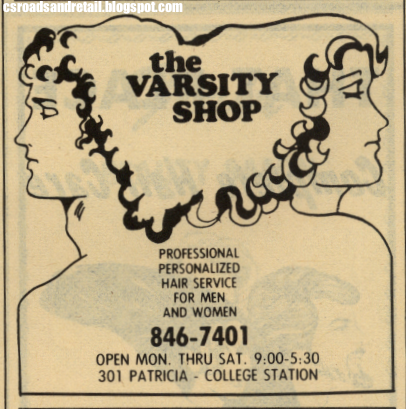 The Varsity Shop, which survived from the 1970s to the 1990s. This ad is from the 1970s. The UtoteM didn't survive long enough to be a Circle K (a 1983 phone book lists it as part of the UtoteM stores, but by 1984, it wasn't listed with the newly rebranded Circle K stores). If it did convert to a Circle K, it was brief: Circle K began to cut back the most run-down stores (many of the former UtoteM stores exist: the convenience store at College Main and Old College DID survive into the Circle K era). 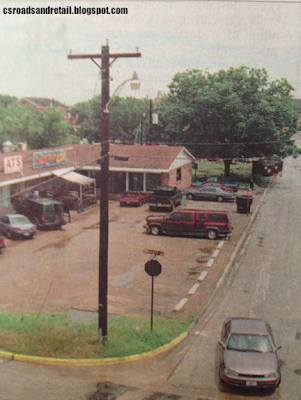 An InSite Magazine issue from 1997 (regarding the Northgate redevelopment) indicated that there was an Indian food store there at one time, but I haven't found it (it didn't seem to be "The Deli Shop", which offered "Frankie's Fried Chicken"). By 1996, it was the offices for the Northgate redevelopment. By the summer of 1997, it was being gutted. Varsity Shop lasted for around 25 years but closed after spring 1996 after "they could not get any of their beauty operators to return because beauty operators depend on following and there were too many rumors going around" (InSite Magazine), which indicates that they were closed in summer. It was suite C, though, that caused the stir when the building was going to be demolished in 1997. 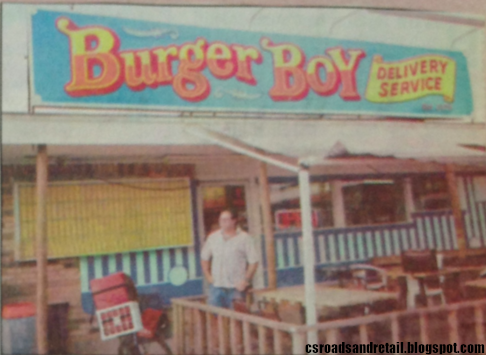 That was Burger Boy at Northgate (the only business left by December 1996), which had been there since the latter part of the 1980s. The owners of Burger Boy at the time felt like the city was overstepping its boundaries in the eviction of the restaurant, and there wasn't any suitable spot to move to Northgate at the time. It had to stay on Northgate, as a full 90% of its business was delivery via bike. It's worth noting that when Burger Boy moved to Northgate, it replaced the restaurant which is now the Bryan Fat Burger. In 1989, they also had their original location at what is La Familia Taqueria at 300 North Texas Avenue but closed it in favor of the Northgate location, which was now (at this point) at the soon-to-be-razed 301 Patricia. I don't know what was there before Burger Boy. Ultimately Burger Boy was able to find a new location in Northgate (what is now Daily Ruckus, though prior to Burger Boy's move-in, it was a garage), which the Sopasakis continued to run for the next 13 years. After the Sopasakis retired, the location soon moved and closed in December 2012 (January 2 had the announcement that it would not reopen). As for the rest of the building, it was flattened in late 1997 or early 1998 for the Northgate Promenade. 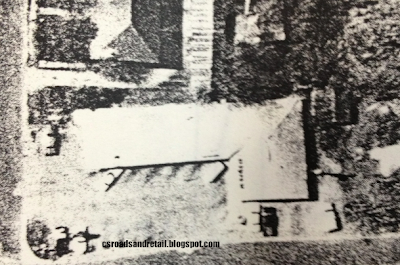 Here is one last picture, from The Eagle with George Sopasakis standing in front of his business. Again, apologies for the quality. January 2011. The Albertsons had been closed for about 13 years by this point. Rhetorical Question: Why am I re-posting this, when I have had it since 2011? The old post was a mess. I had to keep updating it to have it make sense. It became quite antagonistic for reading. CS Roads and Retail is meant to be something you can read for infotainment, not a reference guide, and plus everything had different addresses. The old Albertsons that once anchored the center confused and perplexed many Aggies that have been here over the years, so here's the story. While scanning items for Project HOLD a few summers ago, I found that it opened as a Skaggs-Albertsons, with the center being (apparently named) the Skaggs Shopping Center. This was in 1971. I thought that the Skaggs name was dropped later, but what actually happened was a complicated brand name swap: Skaggs was a drug company, and Albertsons was grocery, so Skaggs Albertsons was a chain that had one of the first now-standard food and drug operations. Here's a picture of a Skaggs Albertsons in Florida. The Skaggs Albertsons would remain until late 1979, at which point Skaggs acquired American Stores, thus renaming itself as American Stores, and turned the store into what many people would know it by: "Skaggs Alpha Beta" in fall 1979. Now, I do have an ad from that era but it's in such unbelievably low quality (for the microfilms, of course) that I'm ashamed to show it to you. Can it be cleaned up with a photo-editing program? Sure. Will I do it? Probably not, especially given at the rate that pictures are ripped off of here on a high basis without "real" visitors. This isn't other people's faults entirely: the new way that Google Image Search works now is rip the image out of context, which is unfortunate. 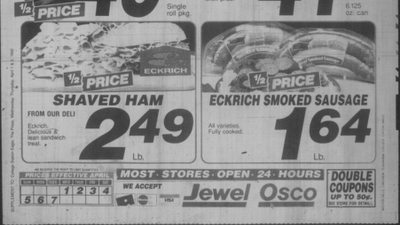 The new "American Stores" company continued to manage this store until it rebranded it as Jewel-Osco in 1991. Shortly after, Albertsons came back and bought the entire market off of American Stores (they would later come back and buy the rest of the company), and rebranded the store as Albertsons. And so from about 1992 to 1997, Albertsons managed a store on the corner of College and University. However, Randalls, an upscale supermarket further down University, sold its store to Albertsons, causing the small supermarket to quickly be abandoned (it closed in November 1997, according to Wikimapia), and it continued stand for nearly another 15 years, longer than it had been any name. 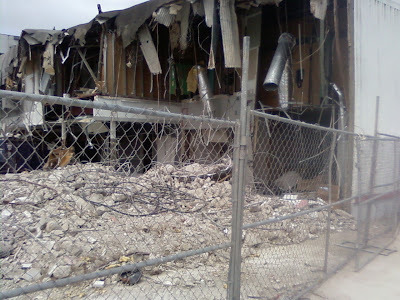 Of course, a vacant building won't last forever, and in 2012, it finally began to come down, with demolition halting for months but continuing about a year later. Not much more than the east wall remains as of this writing. 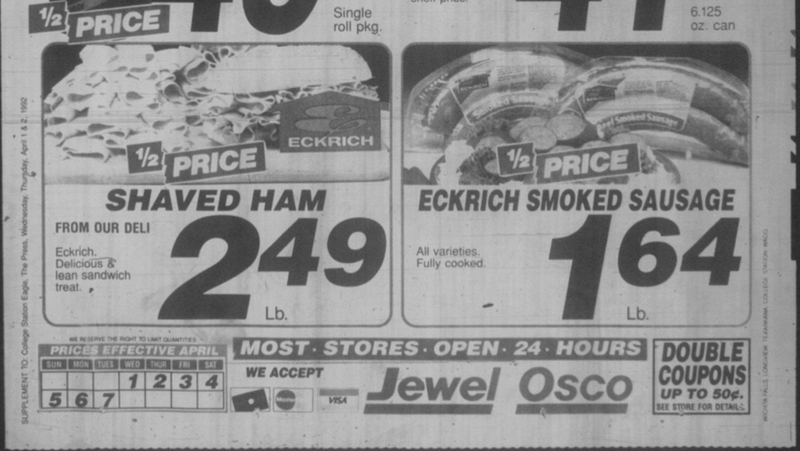 An ad from the brief Jewel-Osco days. Note the "Special Supplement to The Eagle" to the left. 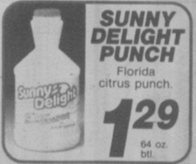 There's even a shot of a Sunny Delight bottle as I remember it, before they changed it to "Sunny D" (and later "SunnyD"). Tangy Original was called "Florida Style" and "Smooth" was "California Style". Regrettably, I couldn't get any of the interior on that shot, or any other time: the windows were painted over, and my one shot of the interiors was kind of messed up by the flash, and while it did capture some of the interior in a blurry configuration that revealed rows of fluorescents and columns, it mostly created a reflection of me, which I didn't like. 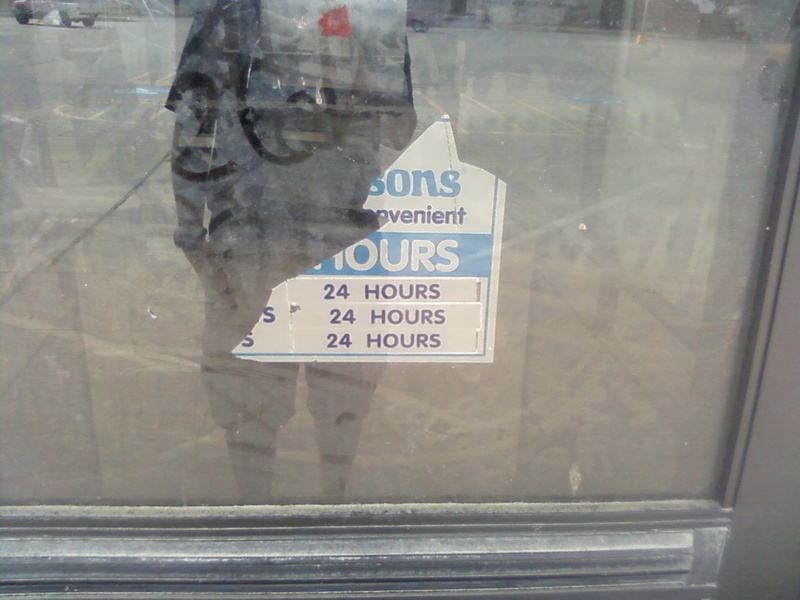 Whoa, Albertsons was open 24 hours! Must have been super-convenient, relatively rare (I don't think even H-E-B did when it first opened), and must have been fun to see at night when the bars had closed for the night. 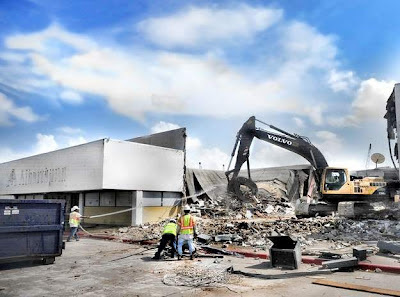 What was left of Albertsons after the first major demo. The first Christmas at the store. From The Eagle, shortly after the demo began. 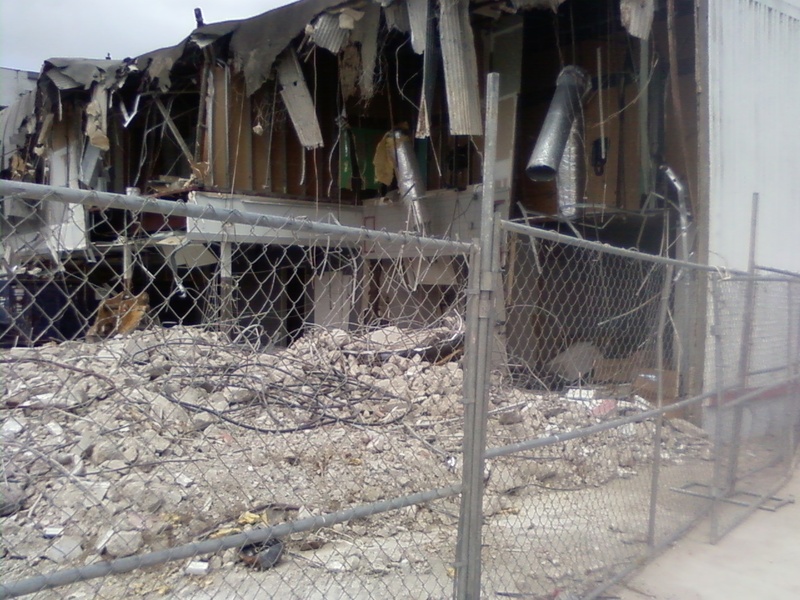 I have even more demolition shots, but there's nothing interesting left. What does it matter? Another piece of our city's history has been wiped off the map. I'd like to think that even though Albertsons is by far not my favorite store, if it had gotten picked up by Kroger or H-E-B, it would be popular today. Yes, it would be considered small and ghetto, probably be pretty dirty, have a pitiful selection, but it would still be profitable enough to be open 24 hours and have a line-up that's almost exclusively oriented toward college students (a mix that would include cut-rate brands, kegs of cheap beer, and a surprisingly good ethnic food selecton), a store simultaneously loved and hated. Too bad that was never the case, and the site is now a fenced-off grassy area, returned to simply potential. This post is super out of date and has been completely outmoded by the newer Post Oak Mall page on Carbon-izer.com, and even that's a bit out of date. As such, this has been removed from the main index of the website. A continuation on our newly rewritten Post Oak Mall coverage that we did not long ago, this is about the food court. I first wrote this back in maybe early 2011 or late 2010 (I'm not sure) but I took it down when the "Superpost" was released. It saddens me that Chick-fil-A (charter tenant) is no longer in business, for instance. Little Tokyo is also gone now with no replacement. There's still life left though. Read on. The food court was much more grandiose than today, featuring eateries on both sides and called "The Gourmet Court". Charter food court tenants included Chick-fil-A, Corn Dog 7, Funnel Cakery, The Great Hot Dog Experience, Giovanni's, Ken Martin's Chicken Fried Steak, Peanut Shack, Pepe's, Potatoes Etc., Salad Bartique, Sesame Hut, and Seafood Shoppe. Orange Julius opened soon after (it was leased but did not open with the mall, apparently), and Taste of the Tropics and McDonald's opened later. I know for a fact that Taste of the Tropics opened a few years after '82, and also Subway opened in 1984 (after the Parkway Square location). Because the food court had been reconfigured at one time (the corridor to the restrooms was different), it's hard to tell what became what. To make this easier, I'll try to cover the food court starting at what is now the boarded up restaurant (and moving clockwise): this was most recently Little Tokyo, which lasted from circa 2008-2009 to January 2012. It wasn't so bad at first. The sushi was good and very reasonably priced. I even got a menu and scanned it. That old link is from a defunct blog I used to run back in early 2010. Unfortunately, the prices went up soon enough, and they seemed to run out of things on a consistent basis: I tried green tea ice cream here, but toward the end, they never had it. Until circa 2006 (and going back to the earliest days of the mall), this was Corn Dog 7. I wished I had gone there, because I enjoy corn dogs, it is a chain, and I think I would enjoy a foot-long corn dog. Since Little Tokyo closed, there's been nothing to replace it and it remains with green cardboard walling off the counter. How depressing. With the rent so high there, it's unlikely anything will replace it soon. Ideally, I'd love to see some tasty local option there. EDIT 10/11: ...and I'm right! Carrera and Stover (see below) will be opening "Salad Sculptors" there, serving gourmet salads and gyros! Directly next to Little Tokyo/Corn Dog 7 used to be Chick-fil-A, which also was a charter tenant and closed on December 24, 2011 to (you guessed it) high rents. 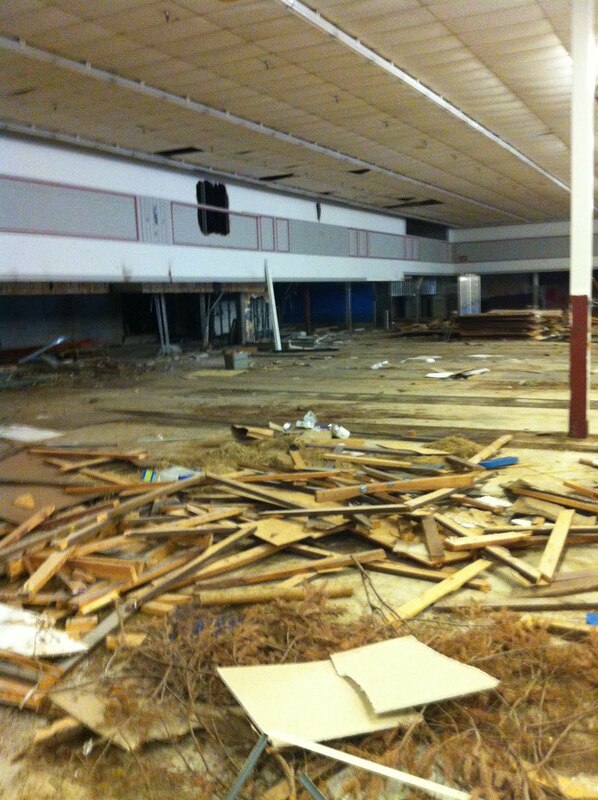 There were other issues too, like the mall not doing renovations (by the time they did, it was too late). It was a bit unique in that it had a small dine-in area with some Aggie memorabilia on the wall, and was a full-featured Chick-fil-A. It was also the first in town, long before the one at Briarcrest was built, or before the campus CFA Express locations. It was replaced with Raising Cane's, which lacked the walk-up area. Now, I have nothing against Raising Cane's: it tastes good and is reasonably priced, but it's no replacement to Chick-fil-A, and I'm sure many agree. To the right of that is Manchu Wok. Manchu Wok used to be good and also reasonably-priced, but I haven't been in a while. I've heard that the food quality has deteriorated somewhat, but just to be safe, I haven't eaten there yet: best keep my good memories intact. Originally, this spot was "Emilio's" (unknown to what it served). Moving onto Roman Delight Pizza, which despite its horribly dated appearance (I don't believe that menu board has changed since the early '90s) is reasonably priced and decent (or so I've heard: I haven't actually eaten there). Up until the early '90s, in fact, it was Sesame Hut: so the menu board (sans prices, of course) hasn't changed since then. Taste of the Tropics has been here since about 2005, it replaced a Subway that lasted up until 2003-2004. Of course, Taste of the Tropics has been here for far longer, but it moved to consolidate the food court more. It's a locally owned smoothie shop. In the early 1980s, this was "The Great Hot Dog Experience". Speaking of locally owned, we now focus on what started out as a McDonald's, which opened sometime soon after the mall opened. It lasted up until 2002 when it was replaced with a Sonic. The Sonic, which lacked a drive-in for obvious reasons, closed in 2012 (apparently it under-performed horribly). While Sonic is never known for having good food (average at best, I'd say), I enjoyed their drinks and "Happy Hour" specials. After that, it was replaced by Charles Stover's Flip & Peel Burgers & Fries. We'll go a bit longer on this subject because I have mixed feelings on Flip & Peel. "This Is Not a Fast Food Chain, Because YOU Deserve Better", the menu proclaims. The burgers run in the range of $6-$8 for the hamburger alone. Since opening, they changed the menu, taking out a few tasty burgers and replacing them with "healthier" turkey burgers. Some of the casualties were the Deluxe Diner Burger (named after a certain defunct Northgate eatery), which had cheddar, lettuce, tomatoes, onions, pickles, mayo, and mustard (a classic tasty hamburger), plus I dislike American cheese. It retailed for $5.99. There was also a smaller "Jr. Diner Burger" that retailed for $3.99. Another casualty was the $7 "Hawaiian Burger": beef, ham, grilled pineapple, provolone, sriracha mayo, and pineapple sauce. Two salads (both $5, add chicken for $2), the Legacy Salad ("artisan greens", red onion. pineapple, Craisins, sunflower seeds) and Rio Grande Salad (artisan greens, guacamole, pico, cheddar) were discontinued (better than turkey burgers, in my opinion). Finally, two fries also sadly departed. There was the "S'mores Fries" ($6) that had sweet potato fries, chocolate sauce, marshmallow sauce, graham crackers, and chocolate chunks. Confusingly, "Nutella Crunchberries Fries" ($7, now $4 like other fries) still survives, which has sweet potato fries, Nutella sauce, raspberry sauce, powdered sugar, and Crunchberries (Cap'n Crunch's Crunchberries). This I actually did try and I disliked it. It wasn't because the sugar overload (I can eat an entire bowl of said cereal and feel fine) but the flavors completely clashed. Finally, there was the "Canadian Fries" (poutine, rhymes with "routine") which had provolone and mushrooms in addition to the classic cheese curds and brown gravy. These were discontinued due to the fact that you can't find cheese curds in the area. I think I remember Stover telling me about he had to import them from a family member in Canada, though I strongly believe it can be found in Houston somewhere. The burgers are pretty tasty: I'm not too sure about the buns used, the Flip Sauce tastes a little strange to me for some reason, and the price still seems on the high end...but I still wish Charles Stover and Sergio Carrera the best in their venture nonetheless. I also did enjoy Primo Pizza, even though they somehow managed to skip the sauce, and am willing to come back. It's worth noting that McDonald's was not the original tenant (possibly coming in during 1992, which makes sense from ads over the years). It was, instead, a branch of Pepe's Mexican Food. Orange Julius was absorbed into Time Out Family Amusement (now American Eagle Outfitters). This probably happened in the early 1990s. Next to it was Taste of the Tropics, which survived into the 2000s before moving to the place it is now (it's now non-food shops, but can't recall what's there currently). Peanut Shack survived into the late 1980s as well (possibly early 1990s). It was more of a snack shack than a food court place. 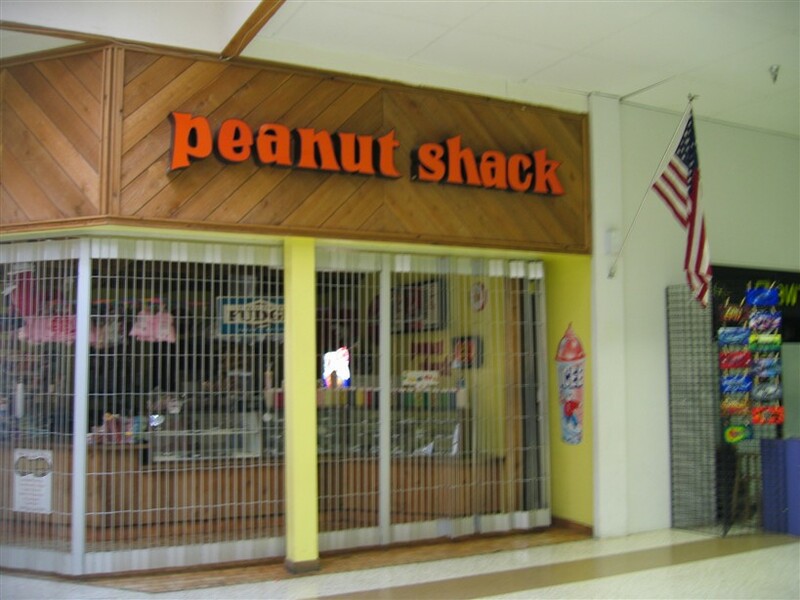 Some years ago the folks at Labelscar snapped a pic of a Peanut Shack at a small-town Oklahoma mall. It was obviously closed for the evening, but that's what it was. Smoothies Ice Cream & Yogurt was the actual name of the restaurant and served pretty much what it's name was, including gyros. Ice cream served was Blue Bell. It became "Nestlé Toll House by Chip" circa 2009-2010, and was originally a Swensen's, which like its Culpepper Plaza relative (which also lasted a whole lot longer), served food (hot dogs, burgers) and ice cream. Giovanni's Pizza was on the north side, later to be Villa Italian Specialties by the 1990s, and eventually, turned into part of Afterthoughts, which became Icing by Claire's, and then Claire's when the two switched places. Where Gymboree's "wall" is today was "Potatoes Etc.". Then, next to it was "The Wagon Wheel Pit BBQ" (now Lids, formerly Hat World). Next to that was one of the first Subway locations in the state and first mall Subway in Texas. It's now Sunglass Hut. 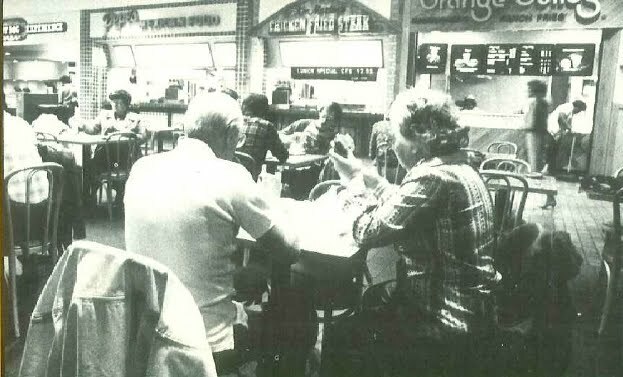 Other food court stores like Salad Bartique, Funnel Cakery, and Seafood Shoppe would replace a few listed above, and even a real Cinnabon once graced the food court in the mid-1990s, albeit briefly. There may be others that I've inevitably missed. As you may have noticed, the food court isn't nearly as large as it was. At least they got rid of the kid's play area (which was built circa 2004?) recently. You can see some directories here. The mall itself as well isn't what was then. Although it still has a dominant on the hold on local clothing stores, it mostly serves as a place to congregate when the weather's unpleasant, which happens often. I wish the food court would grow again. Gymboree doesn't open to the food court side. I wish Gymboree would move out (after all, there are other "nice" shopping centers that would happily accept it, and at a lower rent, too). That space, the one where Potatoes Etc. was, could become another food court space. A mix of local tenants and "first to the market" spaces could fill the remainder. How about another Taco Bueno? Maybe a Ninfa's Express? A barbecue place? The mind boggles with the possibilities. Anyway, here are a few updates. - Our post on the former A&M Consolidated High School / A&M Consolidated Junior High has been updated. - A comment at the Citgo on Northgate clarifies a bit about the Thirsty Turtle. Finally, I implore you: I've worked on this a good deal, so if there's anything wrong, anything you want to add, or say: please write in the comments! I've removed moderation for the recent posts, so have at it!